Top ten Mistakes to avoid in data mining by John Elder. Personal learning networks what they mean to these three student. How they fit in to their educational plan. Many schools and teachers are trying to teach online the way that they have always tought. Here is a animated video created with an online product that talks about changing the way that we think about online learning. This G-Tablet is a device that I like to call personal learning device. This revew was created before Thanksgiving of 2010 and some of the things in this review have been fixed. As the WiFi Problems and the Gmarket so that you can load other apps without sideloading them. There are still some little bugs and in loading apps. You can use this device with Google Apps now. As of Decmeber 5, 2010 the Flash doesn't work on this unit yet and is something that they are working on correcting. As a whole I like the unit and think it will compete hard aginst the Apples IPad device with it selling right now for $379.00 well bellow the cost of the IPad. After the competion hears but by spring these units will be in a perfictly competative market and the cost of these units will be in the range of the Netbooks or under. Rethinking Education for the 21st Century: The Jefferson Parish Public School Story. This school had a chance to reinvent it's educational system after the hurican in New Orleans. We are at a point where we are seeing huge changes in school getting the data needed to complete the puzzle. We can easily and quickly bring data assessment together. In the past we had once a year data and then schools where looking were they went wrong with the process. I like to call this autopsy results and the student had died now we are just looking to see why. We are getting to the point where now we are like the doctors. We get the results before they are dead and assess what we can do to keep them from dying. We do this with RTI weekly assessments with the lowest 20% of our student population and progresses monitor them on a weekly or bi-weekly basis. This is an exciting time if you are a data driven educator. Does this mean we don't rely on our gut instincts and what we know as this is very important also. This data will just help us confirm and check to make sure what we think is working is working. Using a smartphone to create short video lectures. Here is a short video on quizlet and how students could use it to study. Tour of Quizlet.com from Phil Freo on Vimeo. With Google Docs, Their always trying to make you more productive—and part of that means making it possible for you to get things done from anywhere, at anytime. That’s why we’re excited that the new documents editor now supports editing on your mobile browser. This is rolling out over the next few days. You can take minute-by-minute notes at a concert so you’ll always remember the set list. And your friends can jealously follow in real-time at home. In the next few days, they’re rolling this out to English-language users around the world on Android with Froyo (version 2.2) and on iOS devices (version 3.0+) including the iPad. They’ll be adding support for other languages soon. And as before, we also support editing of spreadsheets from your mobile device’s browser. Need to save YouTube video to your phone check out this App it will help you to bring in YouTube video for your classroom. Disney copyright what is fair use using short Disney video clips. Creative Commons - How you can share your work and let people know it is ok. Here is a neat device that may stand to change one to one computing in K-12 Education. It competes with the IPad. Alternative Education lets look at this in a diffrent way. We need to enguage students in learning with Project based learning. Are we teaching our students for the future or as we always have in the past. Multiple Intelligence, it doesn't mean we have to teach it eight ways. Jane McGonigal, Director of Game Research and Development at Institute for the Future, talks about the differences in the increased level of engagement and optimism students have with games over the classroom. This website is a good resource for teachers looking for activites for students learning about the food chain and other science related topics. DO we really understand brain based education. Is it ready to change the way student are educated? Watch this video and see what you think. Online Educaton stands to make a huge impact on learning as we know it. Bill Gates weighs in with his thoughts about online learning. Flexibility - Not only a great skill for PD but teaching as well. You always want a backup plan just in case something is not working, ie the internet. Knowledge - It's very important to have a vast knowledge of the topic you're teaching. You don't have to be a "jedi master" but at least be able to answer the majority of questions. Confidence - This goes along w/ knowledge, nothing is more uncomfortable for the audience then watching somebody who looks like they don't deserve/want to be there. Innovation - I find it very important to use a variety of tools and present information in a new way to keep your audience engaged. Organization - An organized presentation will make the presenter's life that much easier! Resources - One of the things I pride myself on is giving the audience something tangible that they can take back w/ them or download (ie, digital books, CD, etc.). Creativity - This goes hand and hand w/ innovation and helps keeps audience engaged and wanting more. The traditional Powerpoint presentation is no longer realistic for a 21st Century audience. Humility - There is nothing that bothers me more then watching a presentation/educator who thinks they are a "know-it-all". We can always learn more especially from each other. That is exactly what developing a Personal Learning Network is all about. It's vital for a presenter to be open to constructive criticism and be good at self reflection. Humor - It's always nice to be able to open up in front of a large crowd and there is nothing better then having a sense of humor. Remember not to change who you are when presenting but be your self and let your natural sense of humor shine through!! Availability - It is always nice to be available to your audience for networking/answering questions at any time. Make yourself available and approachable to help strengthen your skill set. There are many masters of professional development but a few that come to mind right off the bat are: Naomi Harm, Kevin Honeycutt, and Shelly Terrell. A Greener Frog Dissection- Many schools use frog dissection as part of their science curriculum. Those that are in favor of the “traditional” dissection argue that there is no replacement for a real frog. But wait there is another alternative for this. it is Emantras Interactive Technologies disagrees. Here are two links for you to check out and see what you think. Here is a post that I found on a blogsite the other day after I presented at ETLC in Redford. I have been busy working on the website for Disruptive Innovation, so I have not posted much on the blog site lately. The next hot topic revolves around disruptive innovation. Fred Sharpsteen describes disruptive innovation and how it relates to education. His research specifically relates to how students need a customized learning environment that compliments their individual needs. Technology is the rogue wave that needs to disrupt the educational systems of today. Teaching methods must not just integrate technology but must imbed it into the teaching and learning process. Therein lines our dilemma, with continued cutbacks and loss of funding how do we do that if we don't have the technology? This website is on Disruptive Innovation and is based on the work of the book "Disrupting Class"
Thinking about becoming a Science, Technology, Engineering or Math Teacher (STEM). Here is a fellowship program that will help you to reach your goals. This program is available at six major universities in the state of Michigan. This 21 Things for the 21st Century Project is Based on the National Educational Technology Standards for Teachers. This is at great site to work on learning new skills to help you in the classroom to engauge student in learning. This project was created by 21st Century Educators that are associated with CCRESA, IISD, MISD, SRESD. It is licensed under a Creative Commons Attribution-Noncommercial-No Derivative Works 3.0 United States License. The purpose of this resource is to provide ”Just in Time” training through an online interface for K-12 educators based on the National Educational Technology Standards for Teachers (NETS-T). These standards are the basic technology skills every educator should possess. In the process, educators will develop their own skills and discover what students need in order to meet the NETS for Students, as well as the new MMC Online Experience requirement. Participants who fulfill all of the requirements have the opportunity to earn SBCEU’s. To learn more about the session, look under the tab “The 21 Things”. We hope you take advantage of this unique opportunity. I have really enjoyed working with Bob Frost of the REMC 10 on this project and look forward to seeing the work that is created out of this group of inovative educators. For more information goto this site. Here is how MSU describe the program at MSU. The nationally-ranked Educational Psychology and Educational Technology (EPET) hybrid Ph.D. program is a new substantially online option in the educational technology emphasis area. In response to growing demand for educational leaders who understand how technology, especially online learning, is transforming the world of education, this blended program is designed for experienced education professionals in schools, higher education, and research institutions who want to earn a Ph.D. while continuing in their current positions. The goal of the program is to develop the next generation of educational leaders who understand the need to create new technologically sound pedagogies grounded in innovative research and practice. Students will develop a deep understanding of how theories of learning and development can inform the design of future learning environments. Graduates of this program are prepared to assume leadership roles in K-12 school systems, virtual schools, and community colleges that require rigorous preparation in research and evaluation of learning with technology. The EPET hybrid doctoral program welcomes applicants from a wide variety of disciplinary backgrounds, educational and technology experiences, and social, economic, and cultural backgrounds. Students will complete courses in educational psychology, educational technology, and qualitative and quantitative research methods taught by MSU's internationally renowned faculty designed to develop essential analytic skills needed to be an effective educational leader in an age of data-driven decision making and accountability. The hybrid EPET Ph.D. is a four- to five-year program of study completed substantially online. Please note that the hybrid program begins in the summer of the first year. Students will take three courses each summer typically consisting of a two-week face to face campus session followed by four to five weeks online. Students will also take one online course during the regular fall and spring semesters. The mandatory university residency requirement is fulfilled by the Year III summer session followed by attendance on campus for the Fall term of Year III. Graduate assistantships / fellowships may be available for the fall on campus term. A complete schedule of courses can be found here. The EPET program is one of 5 doctoral programs in the Department of Counseling, Educational Psychology, and Special Education (CEPSE). Faculty in other doctoral programs, especially School Psychology, Special Education, and Measurement and Quantitative Methods, share interests and research work with EPET faculty and students and frequently serve on EPET students’ Guidance Committees. EPET students benefit from coursework and interactions with faculty in many other Departments, inside and outside of the College of Education, including Educational Administration (especially the Higher, Adult, and Lifelong Education program [HALE]); Teacher Education; Writing, Rhetoric, and American Cultures; The Division of Science and Mathematics Education, Psychology; Telecommunications, Information Studies, and Media; and others. Labels: Educational Technology, MSU, Ph.D.
Project Based Learning (PBL): This video is on how to set-up the frame work and what it would look like to engaging students in a new learning model. The state of Maine and it's One to one laptop computers and engaging students in there own personal learning. This theory asserts that behavior can be explained entirely in terms of observable responses to environmental stimuli. Influenced by the conditioned-reflex experiments of Pavlov, behaviorism was introduced in 1913 by J.B. Watson, who, denying both the value of introspection and the concept of consciousness, emphasized stimulus-response laboratory techniques. B.F. Skinner concerned himself exclusively with the relationship of observable responses to stimuli and rewards, and one result was the concept of mastery learning, which was applied in the 1950’s as “teaching machines”. Piaget, Constructivism, and Theories of Cognitive Development by Warren Buckleitner, Ph.D. This is a great video on educational psychology and children learning. The research and writings of Jean Piaget (1896-1980), the Swiss psychologist, have had an enormous impact on the field of cognitive development. Piaget’s observations and theories have helped us better understand the way children think and learn. Piaget’s theories can be divided into two parts: his description of a set of discreet stages through which children proceed, and his explanation of a set of processes that help move a child from one stage to the next. A basic understanding of Piaget’s theories can help the software designer create more developmentally appropriate software. Note that students of educational psychology have successful refuted some of Piagetian theory. However, the big ideas are valuable and commonly used in the design of educational activities. First edition, 1996. Revised January 6, 2006 by Ellen Wolock, Ed.D, Ann Orr, Ed.D. and Warren Buckleitner, Ph.D.
© 2006 Active Learning Associates. All rights reserved. Brief bio: Warren Buckleitner, Ph.D. established Children's Technology Review following 10 years of research at the High/Scope Educational Research Foundation. In 1995, he was awarded the SIIA's Codie Award for "Best Software Reviewer," the only journalist to ever receive a Codie award. From 1997-2003 he coordinated the Bologna New Media Prize, a global award program for children's interactive media. He is an former advisor to Consumer Reports WebWatch and has taught at elementary and college levels. He is also a regular contributor to the New York Times. Here is a short video on nature by numbers and how nature is full of the golden ratio. I think high school students may enjoy watching this 4 min. video and stimulate some question of why we find this repeating patterns in some many different places in nature. This is a short video on Fair Use and what this means to you as an educator in using materials in your classroom to make a point about an educational topic. Are you using material and staying within fair use of copy write materials? Author Robert Wright explains "non-zero-sumness" -- the network of linked fortunes and cooperation that has guided our evolution to this point -- and how we can use it to help save humanity today. Wright thinks the crises the human species now faces are moral in nature, and that our salvation lies in the intelligent pursuit of self-interest. In his book Nonzero, Wright argues that life depends on a non-zero-sum dynamic. While a zero-sum game depends on a winner and loser, all parties in a non-zero-sum gam. Will the Ipod change your classroom? Now we have to figure out how to use them for student learning and instead of taking them away we need to figure out how to use them in a responsible way. Here is an article Coloring outside the line on the TIC website. Well I made to Grand Rapids. 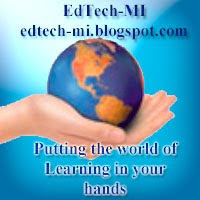 There are many new and exciting technology being featured here at MACUL. The superintendent for the State of Michigan was the Keynote this morning. The white boards are in trouble here as there is many other cheaper solutions then them being shown here today. I will write more tonight about the neat new tools out there to help with K12 educational technology. Look at Epson projection units they have a unit call the 450WI and it has interactive board technology built into them and no need for a white board with electronics built in that can go bad and could be difficult to ship in to repair. There was many sessions on Google docs and how we can us this cloud computing technology to change our students learning by increasing collaboration projects. Danielle Letter again put on a great presentation on how to engage student in learning with an interactive session on Who am I where students learn to open up to a world of learning out side of there normal learning location and to interact with student in a different classroom any where in the world. She is the new leader of TWICE the organization in Michigan that exemplifies how we can use distant learning to connect our children to the world of learning. The other big take away is this for me, there were many sessions on social tool interaction. These were Facebook, Cell phones as personal learning tools, it was YouTube and many other videos. We at most schools are blocking this type of activity but we need to look at why we are doing this if it show great potential to engage students in learning. I believe that we are blocking many of these things because we don't want to be managers of our classrooms and the learning environment. I propose that if we actively engage student in learning they will not get off task as much and they will police them self's. If you walk past a master teacher classroom you don't see them with a big stick just waiting for a student to step out of line. Instead you see a dynamic leader of education inspiring students a guide on the side with student fully engaged in what the learning activity is. Free Math lesson, check it out. Teacher Research in the United States. I would like to make an observation here from the map information in the right hand collum of this bolg. On a weekly bases I see more people from the United State coming to this Educational Techology blog. I think this could show a trend of techers in the United State are working harder than teacher in the rest of the world to find what the right answers are in educating our young people. What do you think it means? Microsoft Courier inteface demo looks to be a tool that I think young people would like. It is a new approach at how they think and abstratct ideas and multitask. Watch this demo show it to some students and let them see what they think of this new tool would work for them? A new inovative tool for learning. You have to see this video it is unbelievable. Johnny lee has some amazing new technology setup. This will change virtual reality technology world. This has great potential for many people even people that are blind in one eye as it creates an illusion of depth of field. You have to watch this video. Do you give students a zero when they don't turn in homework or a project. Read this I have read this now a couple of times from different resources and it makes sense to me. what do you think about the practice of handing out a zero. So what do I mean by soft assessments? This is an assessment that can be made up of data that is an opinion and not factual information. An example of this type of question might be do you like peas or carrots? It doesn't really mater, it is only what you like it is your opinion. You think that you don't have time to find out what your students like in your teaching styles it will take to long to give a questionnaire and then tabulate it. Well then turn to an online survey tool. The power of computers is in compiling and tabulating and analyzing data quickly. Here is a short video over view of Zoomerang survey tool. During his senior year of college, he taught math to 26 inmates, none of whom had finished high school. What he faced was 26 examples of the failure of American education. What he did not realize is the profound effect this would have on his career as a school leader. After teaching for five years, he became a principal because he felt that he could help underserved kids better in that role. Here is his ten ideas that he learned about in the 30 years since he was a principal. Mike McCarthy is the principal of Helen King Middle School in Portland, Maine. This article was also published in the April 2010 issue of Edutopia magazine as "Mike McCarthy's Ten Big Ideas Of School Leadership". You are going to read a tone that I don't often project in this blog. Wow this is a play on words and I was not even trying to-do it this time. "Project" Epson projection unit, oh well. I am Geeked today, I ran into the Promo for the Epson on the 450Wi projector. This is a short throw projection unit, that is just the start of it though. It also has the ability to be an interactive white board without another device, like a Smart board or a Mimio. A little while back I wrote an article on "The Death of the White Board" I would like to see about getting one to put into my district. If I read the promo on this unit and if I see this right, I think it will eliminate the need of smart board’s type of technology. I think I see in the future no need for the smart interactive white boards in the classrooms as this technology will replace them. I think their is also many other alternatives coming quickly. It is as the book, "Disrupting Class" On how Disruptive Innovation Will Change the Way the World Learns as written by Curtis W. Johnson, Michael B. Horn, Clayton Christensen. This looks to be one of the Disruptive innovations. When I first saw another tech use a Wii remote at a cost of less then $150 to create a interactive white board learning tool as good as any of the $1500 + white boards, I know right then that the white board companies were in trouble. It looks like Epson is leading this charge. I would love to be a leader school in creating a room with one of these units to show other k12 schools this strategy. I have the perfect teacher for this he has used Mimeo interactive boards units and smart boards for a while now. He is also a master teacher and knows how to transform learning with these technologies already. So I am excited and I don't get excited to often any more. A few weeks back, I was talking about reading fluency and reading for understanding. I refered to how the two are not the same thing at all. Research says that if a student can read fluently that they have a better chance of understanding what they are reading. But if you want to make sure, then you need to use a best teaching practice to reinforce reading for understanding. This PD training video is just one technique that could be used to develop these skills. Here is a list of words that I think needs to be outlawed or at least not used by an educator any more. I know this is true I was one of those students that was unmotivated, I was also told as a 9th grader that I was not college material by a guidance councilor. I know love to learn and I am engaged every day of my life. I love to learn something new and strive to everyday. This is all because I had a sixth grade teacher, that knew how to motivate and engage me into learning. Thank you Jody Miklovic, for you are one of the rare few that knows how to motivate students into wanting to learn. Here is a sample of a micro lesson on adding for students. I think this technique will help many people to learn concepts in learning. Many times students don't want to hold up there hands in front of there peers. So they will not ask for help or for a teacher to repeat it. But with this help they can watch the video multiple times or rewind and watch a concept that they didn't under stand. Salman Khan (Sal) founded the Khan Academy with the goal of using technology to educate the world Sal received his MBA from Harvard Business School. He also holds a Masters in electrical engineering and computer science, a BS in electrical engineering and computer science, and a BS in mathematics from the Massachusetts Institute of Technology. Here is his website where you can find his video micro lessons. I was thinking about professional development and I was working on my blog site early Sunday morning. I was thinking about the time restraints that we have in K-12 education and professional development. I was entering in some new content to my site and it made me to think about my blog site and why I like it so much. I like this because these are short to the point videos most are three to five minuets. They are power sessions, to the point cut out the fluff. I have an example of what I mean here is the link . Many times I think we get way to wordy in our education and training. The minimalist approach might have some merit in helping us to learn and focus what is important. I believe that we need to focus more on the main content. Kind of like what the power standards are do in helping students to get all the content they need to pass the MEAP. Many times when I read these books on education the 200 plus pages could be condensed or summarized into a chapter or less. So why could we not do this with short Professional development videos and articles. Maybe this is a tool that we could use in K-12 to help meet some of the needs of professional development training of staff also. Here is an Educational website about technology in the classroom. They have some great resources to help find technology that will fit your needs in the classroom. Here is a self description of the website that they have created. In the 21st century classroom rapidly evolving technology and education are inseparable. Most educators cannot imagine using a typewriter after having used a PC. However, when it comes to more advanced applications of new technology, teacher knowledge often falls below student knowledge. Lamentably, teachers do not take advantage of or are simply not aware of the many uses of technology in the classroom. Instead of integrating technology into a lesson, teachers often rely on outdated methodologies. We’re here to help. Our purpose is to make the connection of education and technology as clear and seamless as possible. We want to ensure that you get the full benefit of whatever technology you use in your classroom. This site will provide free information about the uses of technology in the classroom. This site is a thorough, one stop place for all of your pedagogical and practical needs. We believe that through our website, teachers and students will develop proficiency with relevant tools of technology. Come in and take a look around. We are confident that you will find something to use in your classroom or learning environment. This is a video of how to develop reading comprehension. Here is a great way to show students that reading is cool. This is a great way to help get them to understand that reading is cool. We need to find more ways to make education fun and motivate students to want to learn. Check out this video- based off the flashmob Oprah/Black Eyed Peas show!!!! Google Voice - How it could help teachers and connecting to students. Google Voice gives you more control over your phone calls. With Google Voice, you get one number for all your phones, cheap international calls, voicemail like email, and more, for free! (US only). Do you wish you could beter control your student getting ahold of you. Would you rather not give them your home phone number but would not mind taking some calls from students at home with set hours that they would come to that number. Here is a tool to help do this. Only 8% of people off of the street in New York know what a browser was. With computers and computer literacy needed in to days work force, we have much work ahead of us in education. Do you know what a internet browser is? What is a browser? This was the question that was asked of over 50 passersby of different ages and backgrounds in the Times Square in New York. Watch the many responses people came up with. 4. Making Good Decisions (ethics online) – Student are challenges with making good decisions while online, Cyber bullying, Sexting, Tone of voice while making comments and post online. 6. Extended Learning – Any where any time learning, At home, At Play, At Work learning every where there is access. Over the years these issues have not been solved yet: time, money, training, support, access. Time: technology integration needs to become transparent or seamless in it use, it is no longer seen as something on top of what teachers already have to do. In order for this it must become simplistic, something as simple as a traditional pencil. No one has to tell someone how to use a pencil, it is a standard. This is when it will become a part of the entire curriculum. Money: schools looking to save money can begin using solutions which utilize open source and free applications. Training: we need to continue to work toward educating teachers to effectively integrate technology tools. Teachers must make a commitment to change teaching practices. It is not good enough to go the conference learn the best management practices and then go back in the room behind closed doors and change nothing. Support: If we offer support and professional development training, teachers will never change the way they use technology. This support must be timely if you want them to integrate it in to there lesson plans. Access: this is an issue. We must provide fast connections needed for the new Web 2.0 applications and streaming video. See http://www.rtinetwork.org for more information. What is Science Buddies, according to their website, “it is Hands-on scientific investigations are acknowledged to be the best way to teach science literacy. Science Buddies supports these activities by providing free science fair project ideas, answers, and tools to teachers, parents, and students from all walks of life. Our objective is to save our users' time while guiding them to a successful outcome. By reducing the hassles of doing a science fair project, Science Buddies aspires to improve project quality and increase science fair participation, turning a good learning experience into a great one.” This site has many good k12 resources to help student to develop a science fair project. I think this quote is well fit to education and the reforms that we need in education. In today's world we want change to be instant. Educational change is not quick it is the thousand mile journey and the only way to complete this journey is with a single step followed by another and another until we have walked a thousand miles. Only then will we have made a difference in student learning. 1. Self-motivated: Students who can direct their own learning environment, fulfill course requirements and achieve individual academic success. 2. Independent learner: The online environment enables students to learn at their own pace, whether it’s traditional, extended or accelerated, relieving the stress of feeling rushed or pressured and providing enjoyment in the learning process. 3. Computer literate: Although it’s not necessary to have advanced computer skills, students should possess a working knowledge of electronic email, the Internet and basic keyboarding skills. 4. Time management: Students must be able to organize and plan their own best “time to learn.” There is no one best time for everyone, but the key to learning is to commit the time to learn. 5. Effective writing skills: Students must use electronic email to communicate with their peers as well as their instructors. The ability to write clearly in order to communicate ideas and assignments is very important to student success as well as a means to inform instructors of any concerns or problems. 6. Personal commitment: Since there are no bells that begin and end classes, students must have a strong desire to learn and achieve knowledge and skills via online courses. Making a commitment to learn in this manner is a very personal decision and requires a strong commitment to participate in order to achieve academic success. Mobile Computing - Stands to take the K12 educational environment by storm over the next 12 to 24 months. So as a k-12 educator you need to look at how you will Incorporate these devices into your learning environment instead of how we keep them out of the school day. Here is a video that talks about how they are being brought into and used in Western Ill. College. Gesture-based computing - The 2010 Horizon Report is an attempted to look into a crystal ball and tell us what the next educational trend will be. I think Gesture-based computing will be one of these new trends. Did you see minority report? If you did you will remember the part in the movie were Tom Curse is manipulating a computer on a huge wall screen with movements of his hands. one of the weakest components of the computer is the human input interfaces that we use to manipulate what we want them to-do. The voice interface is not perfected and this looks to be one of the next user interfaces that will be come common palace in the next three to five years. Attached to this blog below is a short video demonstrating the Gesture-based computing. I think this saying is very poetic in talking about schools and classroom lecturing. If we just lecture we will not have long-term learning. When you see it you may remember it longer. But if you really want to understand a subject do it and do it again this helps commit it to long-term learning. Now if you want to take it one step further then teach what you know to someone else. If you feel proficient in what you have learned this is good but it takes on the next level of learning to be able to teach someone else.